Planning for the Future. Moving Forward Together. We all need electricity. That need is only increasing with more flat screen TVs, smart phones, tablets, and other must have gadgets. Today, the average Long Island household uses 20% more electricity than as recently as the late 1990s. To meet our energy needs and reliability expectations, our electric grid must keep up. That’s why the Long Island Power Authority (LIPA), Farmingdale State College, and Stony Brook University are working together on a better path for Long Island’s energy future. Our Smart Energy Corridor Project will study how new technology can improve service, save energy, control costs, and support new jobs. 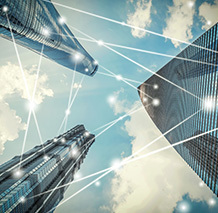 This “Smart Grid” project, along the Route 110 business corridor, is supported by a $12.5 million grant from the U.S. Department of Energy and matching funding from the State University of New York Research Foundation and LIPA. The Route 110 corridor was approved by the DOE as it is a major economic hub for Long Island with a highly developed, compact area that has a large number of commercial, industrial, and residential customers. In terms of its electric usage as well as demographic profile, it is typical of other hubs in New York State and elsewhere, particularly in the areas surrounding New York City. Approval for funding from the DOE was partly based on the ability to apply what we learn from the Smart Energy Corridor Project to other regions. RELIABILITY: A Smart Grid uses two-way communication to provide more and better data in real time to increase reliability and efficiency. Result: an improved electric system with lower costs and fewer power outages. ENERGY UNDERSTANDING: By using newly available data and ways to interact with energy consumers, we will help encourage better energy decisions that lead to more efficient and cost-effective energy use. Result: savings for electric customers and reduced environmental impact. PUBLIC EDUCATION: Both schools will conduct public awareness and educational initiatives to help Long Islanders understand the benefits of Smart Grid technologies. Result: an informed and empowered society. TECHNOLOGY: Cutting-edge technology will be demonstrated in real-world simulations on the campus of Farmingdale State College. This includes new power sources, Smart Meters, customer-friendly energy management tools, and support for plug-in hybrid electric vehicles. Result: consumer-friendly ways to help manage energy costs. 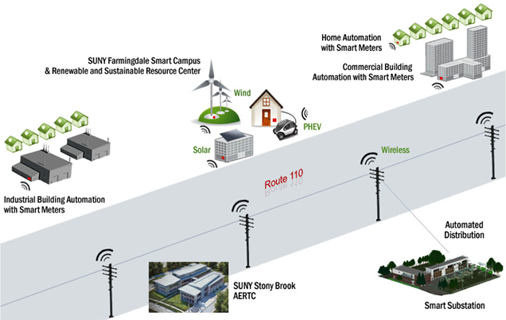 JOB CREATION: Both Farmingdale and Stony Brook will conduct training for Smart Grid technologies and clean energy jobs. Stony Brook will use its economic development resources on the opportunities emerging from the project, to create new businesses and new jobs. Result: a boost to Long Island’s economy. CYBER SECURITY: A computer on the other side of the world can be one of the most daunting threats facing our energy infrastructure. Stony Brook will develop procedures and technical controls to prevent, deter, and increase resilience to cyber-attacks. Result: protection of our communities. Click here for a pdf of project description.